By using new airmobile techniques, the 1st Cavalry seemed to achieve victory in the Ia Drang using standard, conventional operations. Moore had attacked and defended, terms that any World War II or Korean War veteran could comprehend. Daddis’s fundamental error lies in asserting that the victory was achieved at Ia Drang by “1st Cavalry” and by “using new airmobile techniques”. In fact, it was achieved by the US Air Force and by using the Arc Light strategic bombing. To the contrary of the general understanding of the US military establishment, the US military historians and scholars, the main trust at Ia Drang was the five-day B-52 airstrike operation and the secondary trust was the Long Reach operation that 1st Cavalry conducted in three phases – All the Way of 1st Air Cav Brigade, Silver Bayonet I of 3rd Air Cav Brigade and Silver Bayonet II of 2nd Air Cav Brigade. Daddis fails to grasp the operational concept of the “Pleiku Campaign” (the correct name is Long Reach or Pleime-Chupong campaign), which consists in using B-52 airstrikes with the support of 1st Cavalry ground forces to annihilate the three NVA regiments at Chupong. And for failing to be aware that the Ia Drang battle was a diversionary maneuver in support of the main action executed by B-52 airtrike, Daddis's narration of this battle in his dissertation is way off the mark. Following is an excerpt of the dissertation pertaining to Ia Drang battle (page 124-133); some inaccurate statements are highlighted. Apparently helicopters had not cracked the puzzle of the intelligence battle. (4) Kinnard continued to press west toward the Cambodian border, directing Lieutenant Colonel Harold G. Moore’s 1 st Battalion, 7th Cavalry to search the Ia Drang valley near the Chu Pong Mountain area. Moore expected to make contact and on 4 November, after an early aerial reconnaissance of prospective landing zones (LZs), his battalion of 431 men began their flights deeper into the western plateau. Moore’s actions at LZ X-Ray quickly, perhaps predictably, eclipsed McDade’s at Albany. Yet was the Ia Drang battle really a victory? U.S. officials quickly hailed it as such based on familiar metrics. Discounting the catastrophe at Albany, MACV focused on the satisfyingly low ratio of American to enemy casualties. Body counts revealed Moore’s troopers killed 634 NVA soldiers—while “estimating” another 1, 215—compared to losing 75 killed and 121 wounded. (MACV did not publicize McDade’s losses.) To MACV, such casualty ratios demonstrated the validity of the airmobile division’s use of firepower and mobility. Body counts also appeared to validate MACV’s long-term objective of breaking the enemy’s will through a strategy of attrition.60 Through conventional lens, Westmoreland later celebrated the 1st Cavalry’s apparently decisive victory. “We had no Kasserine Pass as in World War II, no costly retreat by hastily committed, understrength occupation troops from Japan into a Pusan perimeter as in Korea.” 61 American troops, bearing technologically advanced weaponry, had stood their ground against the finest troops North Vietnam could offer. More, they inflicted a greater number of casualties and sent the enemy fleeing from the battlefield. Just as predictably, the North Vietnamese embraced a different view of their first large-scale battle with the Americans. Common infantry soldiers had withstood the firestorm of American airpower and heliborne assault tactics. As Moore recalled, by Hanoi’s “yardstick, a draw against such a powerful opponent was the equivalent of a victory.” 62 More importantly, American firepower could be effectively countered, as seen during the destruction of McDade’s forces at Albany. By closing in tight with the 1st Cavalry troopers, the NVA could negate U.S. advantages in weaponry. (7) One former PLAF general officer remembered “the way to fight the American was to ‘grab him by his belt’…to get so close that your artillery and air power were useless.” 63 While Americans rejoiced in their victory at Ia Drang, they failed to consider that their new airmobile tactics might have an Achilles’ heel. (8) It seemed not to faze any of the 1st Cavalry Division or MACV’s leadership that B-52 bombers were needed to save Moore’s battalion. Hanoi’s leadership arguably took a more balanced appraisal of the fighting in Pleiku province. Helicopter assaults could be disrupted successfully but only at a heavy price. It was not yet time to progress into the final conventional phase of revolutionary war. Certainly a few Americans appreciated that helicopters had not wrested the initiative from either the Vietcong or the NVA. If official channels conveyed little doubt, some U.S. soldiers expressed their suspicions of airmobility’s touted invincibility to the media. After the Pleiku battles, New York Times military correspondent Hanson W. Baldwin recounted how some 1st Cavalry officers questioned both the airmobile division’s staying power and the number of ground forces needed to effectively search out and destroy the enemy. Pulitzer-Prize winning journalist and photographer Malcolm W. Browne quoted one U.S. advisor who doubted airmobility’s utility in a counterinsurgency environment. The officer noted “the Viet Cong have no helicopters or airplanes. They didn’t have any during the Indochina War either, but they still won.” The advisor then offered a veiled critique of the airmobility concept and the larger American approach to revolutionary warfare in Vietnam. “After all, when you come to think of it, the use of helicopters is a tacit admission that we don’t control the ground. And in the long run, it’s control of the ground that wins or loses wars.” 66 Such introspection hardly occurred within MACV’s own assessments of the recent Pleiku campaign, speaking volumes to the integrity of the evaluation system that was measuring effectiveness and progress in the field. In reality, the 1st Cavalry Division’s “success” temporarily alleviated the confusion created by MACV’s abundant measurements of effectiveness. Ia Drang served to reduce the clutter of excessive metrics and provide army officers with an organizationally and culturally comfortable indictor for success: the exchange ratio. Traditional concepts of firepower and maneuver still mattered. Victory could still be defined by the destruction of any enemy unit. In the aftermath of Ia Drang, many army officers seemed not to consider, as Westmoreland had earlier mused, that if NVA regiments could be so decisively defeated in the field by American firepower they might realize the futility of fighting conventionally and revert to guerrilla tactics. The U.S. Army simply believed it could impose its will on a peasant army and society. In the process, MACV took the “estimation” of enemy dead in Moore’s after action report at face value. (9) By using new airmobile techniques, the 1st Cavalry seemed to achieve victory in the Ia Drang using standard, conventional operations. Moore had attacked and defended, terms that any World War II or Korean War veteran could comprehend. Thus, the metrics determining effectiveness of such operations did not require alteration. For the military component of Westmoreland’s strategy, Moore’s troopers had established the benchmark. If terrain could not serve as a scorecard, the body count would help keep tally. Kinnard’s official after action report noted that “when results of any action or campaign are assessed, statistics must be utilized. In many cases it is the only way results can be shown in a tangible manner and, therefore, readily grasped.” 70 The report then proceeded to discuss its breakdown of enemy casualties, weapons captured, and friendly losses. Statistical analysis came through the Ia Drang battle as unscathed as MACV’s faith in helicopters. Among those statistics, however, the body count rose to the dominant indicator for success in the minds of many officers. Lieutenant Colonel Hal Moore had set the standard for the army, killing an “estimated” 1,849 enemy soldiers in only a few days of fighting. Surely other officers would want to follow in his footsteps. 52	Kinnard quoted in Johnson, Winged Sabers, 5. On American reliance on technology, see Kolko, Anatomy of a War, 188 and Baritz, Backfire, 51. On the capabilities of helicopters, see Department of the Army, Field Manual 57-35, Airmobile Operations, September 1963, 4. 53	French experience in Bernard F. Fall, Street Without Joy (Mechanicsburg, Pa.: Stackpole Books, 1961, 1994), 361. On ideology and technology, see Marilyn B. Young, The Vietnam Wars, 1945-1990 (New York: HarperCollins, 1991), 112. The deputy director of the State Department’s Vietnam Working Group wrote in August 1962: “Politics is people. People d on’t change quickly. Helicopters can move fast; attitudes take longer.” FRUS, 1961-1963, II: 571. 54 1st Cavalry deployment in Carland, Stemming the Tide, 54-62. On central highlands encampment, see: Wilbur H. Morrison, The Elephant and the Tiger: The Full Story of the Vietnam War (New York: Hippocrene Books, 1990), 188; Robert B. Asprey, War in the Shadows: The Guerrilla in History (Garden City, N.Y.: Doubleday & Company, Inc., 1975), 1112; and Moyar, Triumph Forsaken, 392. Shakedown exercises in Stanton, Anatomy of a Division, 46-47. North Vietnamese infiltration in JCS History, Part II, JCSHO, 22-1. The divisional spokesman noted in early October that “we are not tied to the jungle or the paddies. We can avoid ambush. We fly over it and strike unexpectedly.” In “1 st Cavalry Brings Mobility to War Against Viet Cong,” Minnesota Tribune, 10 October 1965. 55	MACV Monthly Evaluation Report, October 1965, MHI, 2. Robert Mason, Chickenhawk (New York: The Viking Press, 1983), 101-102. Plei Me battle in Carland, Stemming the Tide, 99-104. Herring, America’s First Battles , 309-313. The NVA regiments taking part in the campaign were the 32nd, 33rd, and the 66th which was held in reserve. 56	Losses in the Plei Me battle from Herring, America’s First Battles , 313. Brown quoted in Stanton, Anatomy of a Division, 55. On the lead up to Ia Drang, see Carland, Stemming the Tide, 104-111 and Stanton, Rise and Fall, 56-57. The 1st Brigade made significant contact on 6 November, running into a well-placed ambush that pinned down a battalion’s worth of American soldiers. Herring, America’s First Battles, 315. 57 Moore biographical sketch in Coleman, Pleiku,187. Deal in Christian G. Appy, Patriots: The Vietnam War Remembered from All Sides (New York: Viking, 2003), 131. Neil Sheehan, A Bright Shining Lie: John Paul Vann and America in Vietnam (New York: Random House, 1988), 573. The best account of the battle, and a fine piece of military history, is Harold G. Moore and Joseph L. Galloway, We Were Soldiers Once...and Young (New York: HarperCollins Publishers, Inc., 1993). On artillery fires initially being ineffective, see John A. Cash, John Albright, and Allan W. Sandstrum, Seven Firefights in Vietnam (Mineola, N.Y.: Dover Publishers, Inc., 2007), 17. 58 Moore, We Were Soldiers Once, 133. On fighting three separate actions, see Coleman, Pleiku, 205. Use of B-52 bombers from Herring, America’s First Battles , 319. 59	Quotation from Jack P. Smith, “Death in the Ia Drang Valley,” Saturday Evening Post Vol. 240, No. 2 (28 January 1967): 82. Harry W.O. Kinnard, “A Victo ry in the Ia Drang: The Triumph of a Concept,” Army Vol. 17, No. 9 (September 1967): 89. Albany ambush in Carland, Stemming the Tide, 136-145. Casualties on p. 145. Carland notes that the battalion’s daily journal from 16-22 November mysteriously vanished, helping the fight at Albany “disappear from officia l discussions of the Pleiku battles.” See also Stanton, Rise and Fall, 59-60. 60	Casualty numbers taken from After Action Report, Ia Drang Valley Operation, 1st Battalion, 7th Cavalry, 14-16 November 1965, 13. Copy of original report downloaded from www.lzxray.com. On low ratios confirming MACV’s attrition strategy, see Leslie H. Gelb with Richard K. Betts, The Irony of Vietnam: The System Worked (Washington, D.C.: The Brookings Institute, 1979), 135. Micheal Clodfelter called the battle of Ia Drang a “distinct victory for American firepower and mobility.” Vietnam in Military Statistics: A History of the Indochina Wars, 1772-1991 (Jefferson, N.C., London: McFarland & Company, Inc., Publishers, 1995), 71. 61	Westmoreland, A Soldier Reports, 191. See also Report on the War in Vietnam, 99. “The ability of Americans to meet and defeat the best troops the enemy could put on the field of battle was once more demonstrated beyond any possible doubt, as was the validity of the Army’s airmobile concept.” Harry G. Summers, Jr. argued that “it might have been better in the long run if we had lost this first battle, as we had lost the first major battle of World War II…. Our initial defeat in North Africa scared us with the knowledge that if we did not devise better strategies and tactics, we could lose the war.” See “The Bi tter Triumph of Ia Drang,” American Heritage (February-March 1984): 58. By ignoring the political context of the war, Mark W. Woodruff offers a one-dimensional, naïve evaluation of how battles like Ia Drang were clear-cut victories for American forces. Unheralded Victory: The Defeat of the Viet Cong and the North Vietnamese Army, 1961-1973 (Arlington, Va.: Vandamere Press, 1999), 69-87. 62	Moore, We Were Soldiers Once, 399. For Hanoi’s assessment of the fighting, see Victory in Vietnam, 159-160. 63	Hoang Anh Tuan quoted in Cecil B. Currey, Victory at Any Cost: The Genius of Viet Nam’s Gen. Vo Nguyen Giap (Washington, London: Brassey’s, Inc., 1997), 257. General Vo Nguyen Giap recalled, “You planned to use [air mobile] tactics as your strategy to win the war. If we could defeat your tactics—y our helicopters—then we could defeat your strategy.” Ib id. On early enemy reactions to U.S. helicopters in 1962, see Tolson, Airmobility, 26-27. On the enemy’s capability at countering U.S. advantages in firepower, see Carland, Stemming the Tide, 149 and Rosen, Winning the Next War, 94. 64	Palmer noted “Victory in Vietnam was hard to measu re.” Palmer went on to argue, however, that “the outcome of the fighting along the Ia Drang and under the Chu Pong was a victory in every sense of the word.” Summons of the Trumpet, 102. On success of 1st Cavalry’s spoiling attack, see Kinnard, “A Victory in the Ia Drang,” 72. On MACV overlooking important facts, see Krepinevich in Showalter, An American Dilemma, 96. On Army Chief of Staff Harold K. Johnson’s views of destruction versus control, see Sorley, Honorable Warrior, 201. 65	MACV Monthly Evaluation Report, November 1965, Annex E, 31-35, MHI. Although Moore acknowledged this issue in We Were Soldiers Once...and Young, 398-401. 66 Advisor quoted in Malcolm W. Browne, The New Face of War, rev. ed. (Indianapolis, New York: The Bobbs-Merrill Company, Inc., 1968), 79. Hanson Baldwin, “U.S. First Cavalry is Sternly Tested,” The New York Times, 20 November 1965. On asking how much increase in mobility helicopters actually provided, see James H. Pickerell, Vietnam in the Mud (Indianapolis, New York: The Bobbs-Merrill Company, Inc., 1966), 45. See also Gerard J. DeGroot, A Noble Cause? America and the Vietnam War (Harlow, Essex: Longman, 2000), 149. 67	Johnson in The U.S. Government and the Vietnam War, Part IV, 101-102. On self-delusion in the army, see Herring, LBJ and Vietnam, 37. Zaffiri notes the massive amounts of firepower rushed in to save the beleaguered 1st Cavalry, an aspect of the fighting not highlighted by MACV. Westmoreland, 152. 68	Field Manual 31-16, 21. 69	On narrow lessons from the campaign, see Benjamin S. Silver and Francis Aylette Silver, Ride at a Gallop (Waco, Tx. : Davis Brothers Publishing Co., 1990), 316. See also Coleman, Pleiku, 267-269. On conventional organizations potentially not being suited to counterinsurgency, see Boyd T. Bashore, “Organization for Frontless Wars,” Military Review Vol. XLIV, No. 5 (May 1964): 16. On discounting dangerous weaknesses, see Palmer, Summons of the Trumpet, 97. DeGroot maintains that “helicopters provided the illusion of offensive mastery.” A Noble Cause?, 149. 70	Operations Report, Lessons Learned, 3-66, The Pleiku Campaign, 10 May 1966, CMH Library, 213. On MACV requiring no more feedback other than body counts, see Krepinevich, The Army and Vietnam, 169. (1) On the 23rd Kinnard received permission from Westmoreland to transfer his entire 1st Brigade to Pleiku, only twenty-five miles away. Relying heavily on artillery and tactical air support, the Americans responded with overwhelming firepower. = However, although he did transfer the entire 1st Brigade to Pleiku, only one infantry battalion – 2/12 Air Cav - was assigned to defend the Pleiku airfield/Pleiku City and one artillery battalion -Battery B, 2/17 Arty - was helilifted to Phu My to lend support to the ARVN Armored Relief Task Force. The rescue mission of Pleime, remained under the responsibility of ARVN II Corps Command. (2) Lobbying MACV to unleash the division onto the offensive, Kinnard received authorization on 28 October to pursue Man’s withdrawing units. Despite this plethora of intelligence to the contrary at the field command level, Kinnard, acting on the orders from Task Force Alpha (the American command’s euphemism for a corps headquarters), told Brown to begin his search south and east of Plei Me. For some reason, Swede Larsen and his staff, and probably the operations and intelligence people up the line at MACV as well, were convinced that some of the North Vietnamese had slipped away to the south and east to the hill country about fifteen kilometers from the Plei Me camp, and they were adamant that the Cav should start turning over rocks in that area. The last of the 1st Brigade’s units departed the area of operations, bound for An Khe, and the third of the 3rd Brigade’s three maneuver battalions arrived. All three battalions now were working the color-coded search areas generally between Plei Me camp and Highway 4. It had been a dry hole for everyone, and General Knowles and Tim Brown were getting impatient and starting to look longingly toward the west. Knowles had long wanted to stage some kind of operation inside the Chu Pong Massif. That day, General Larsen was visiting the division’s forward command post at the II Corps compound. He asked Knowles how things were going. Knowles briefed him on the attack on Catecka the night before and then told him the brigade was drilling a dry hole out east of Plei Me. Larsen said, “Why are you conducting operations there if it’s dry?” Knowles’s response was, “With all due respect, sir, that’s what your order in writing directed us to do.” Larsen responded that the cavalry’s primary mission was to “find the enemy and go after him.” Shortly after, Knowles visited Brown at the 3rd Brigade command post and told him to come up with a plan for an air assault operation near the foot of the Chu Pongs. On 10/27, the lead elements of the 33d had closed on it forward assembly area, the village Kro (ZA080030); on 10/28, the 32d Regiment had nearly closed its base on the north bank of the Ia Drang; on 10/29, the 33d Regiment decided to keep the unit on the move to the west, to Anta Village (YA940010), located at the foot of the Chu Pong Massif; on 11/1, the 33rd regiment headquarters closed in at Anta Village; on 11/2, by 0400 hours, the 2d, the regimental CP had arrived at Hill 762 (YA885106); on 11/05, units of 66th Regiment continued to close in the assembling areas in the Chupong-Iadrang complex; on 11/07, the depleted 33d Regiment licked its wounds and waited for its stragglers to come in, meanwhile the remainder of Field Front forces were quiet; on 11/08, only fragmented units and stragglers remained east of the Chu Pong-Ia Drang complex; on 11/09, the 33d Regiment gathered in the last of its organic units; on 11/11, the three battalions of the 66th Regiment were strung along the north bank of the Ia Drang river (center mass at 9104), the 32nd Regiment was also up north in the same area (YA820070), the 33rd Regiment maintained its positions in the vicinity of the Anta Village, east of the Chu Pong mountains. (4) Kinnard continued to press west toward the Cambodian border, directing Lieutenant Colonel Harold G. Moore’s 1 st Battalion, 7th Cavalry to search the Ia Drang valley near the Chu Pong Mountain area. The choice to go into the Chu Pong, a longtime enemy sanctuary [near the Cambodian border] into which ARVN had never gone, was not mine. It was either that of General Knowles or the brigade commander. We hadn't looked at the area. It wasn't intelligence that led us there. If anything, it was the lack of intelligence, and this seemed a logical place. (5) Man in fact had consolidated his forces within the Chu Pong massif awaiting the Americans’ next move. Dan Thang 21 operation finished, Pleime camp was back on its footing, but among the two VC Regiments that had joined in the attack, we only inflicted the enemy with more than 400 killed. The withdrawal was a rational and intelligent initiative taken by the VC Field Front Command. But the enemy would attempt to take revenge and furthermore, the remote Pleime camp remains an eye sore to them. (6) So desperate had Moore’s position become that MACV authorized the use of B-52 strategic bombers from Guam for close air support. On 16 November, unable to break the cavalry’s perimeter, the NVA commander, as at Plei Me, decided he could do no more against American firepower and began withdrawing his forces from the landing zone area. = Moore’s position had never reached the point of desperation. 1/7 Air Cav was always reinforced with sufficient troops to hold its defensive perimeter: B/2/7 Air Cav at 6:00pm on November 14; at 9:15 am on the next day November 15, the entire 2/7 Air Cav was present at LZ X-Ray; and at 12:05 pm on the same day, 2/5 Air Cav closed in to rescue the isolated platoon. - 11/15/65 at 10:30H: MAVC J3 (Gen DePuy) Gen DePuy called Col Barrow and asked if Arc Light had been cleared with CG II Corps. Col Barrow replied yes, CG II Corps has approved Arc Light. Target area approved by Col Barrow and Col McCord. Also Gen DePuy wanted to know if the elem of 1st Cav had received the 151600H restriction on not going west of YA grid line. Col Barrow informed Gen De Puy that the 1st Cav had acknowledged receipt of the restriction and would comply. Gen DePuy personally changed target configuration. Those troops still remaining in the now deserted X-Ray area suddenly learned of the reason for the exodus of the cavalry. A B-52 strike had been called in virtually on top of the old positions. = That PLAF general officer did not realize though that his troops were not facing combat with ground units that could be ‘grab by the belt’ but were rather annihilated by B-52 airstrikes that came down over their heads with the American ground troops standing at a 3-kilometers distance. (8) It seemed not to faze any of the 1st Cavalry Division or MACV’s leadership that B-52 bombers were needed to save Moore’s battalion. 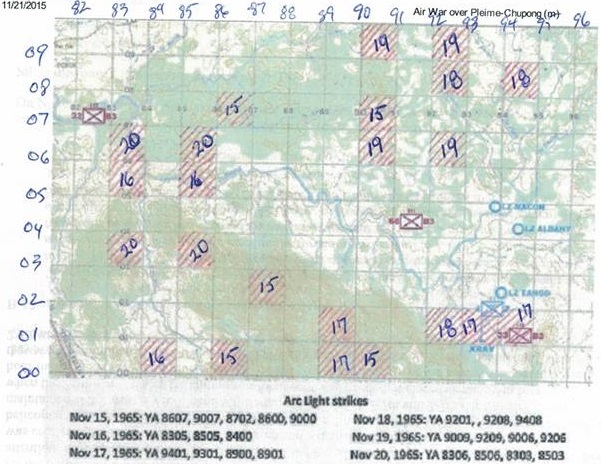 The Chu Pong base was known to exist well prior to the Pleime attack and J2 MACV had taken this area under study in September 1965 as a possible B-52 target. (9) By using new airmobile techniques, the 1st Cavalry seemed to achieve victory in the Ia Drang using standard, conventional operations. Right after the Plei Me siege was broken, I felt that it was up to me to find these guys who had been around the camp. So we came up with a search “modus operandi” in which the Cav Squadron was going to range widely over a very large area and I was going to use one infantry brigade to plop down an infantry battalion and look at an area here and there. I felt that we had to break down into relatively small groups so we could cover more area and also the enemy would think he could fake us. You couldn’t put down a whole battalion out there and go clomping around. You had to break down into company and platoon-sized units. You had to rely upon the fact that with the helicopter you could respond faster than anyone in history. I then learned, totally new to me, that every unit that was not in contact was, in fact, a reserve that could be picked up and used. This is my strategy. Start from somewhere, break down into small groups, depending upon the terrain, and work that area while the Cav Squadron roamed all over. The name of the game was contact. You were looking for any form of contact – a helicopter being shot at, finding a campfire, finding a pack, beaten-down grass. Instead, 1st Air Cav’s mission in landing at LZ X-Ray was a diversionary tactic aiming only at fixing the three NVA regiments at their assembly positions to allow B-52 bombers to strike by holding its defensive perimeters in a blocking position and not spreading out in pursuit of the enemy troops. This explains why 1/7 Air Cav was extracted on November 16 and 2/7 and 2/5 Air Cav on November 17. General Knowles reveals that the purpose for the insertion of the Air Cavalry troops at LZ X-Ray on November 14 was to “grab the tiger by its tail” and to hit its head with B-52 airstrikes from November 15 to 16. He also explains the reason for pulling out of LZ X-Ray on November 17 and moving to LZ Albany was “to grab the tiger by its tail from another direction” and continued to hit its head with B-52 bombs from November 17 to 20. Since it is a scholarly essay, Daddis took great care in relying his account of the Ia Drang batlle on solid references comprising primary sources and personal accounts of participants of the battle. However his study was not comprehensive and deep enough, which leads him to misinterpret and to misunderstand what really happened at Ia Drang battle: that it was just a piece of action in the vast scheme - that needed 38 days and 38 nights to carry out - of using B-52 airstrike to annihilate the three NVA regiments at Chupong massif. Daddis’s shortcoming is typical and common in the current literature pertaining to Ia Drang battle. What if there was no master plan for Pleime Counteroffensive? Review of "Intelligence Aspects at Pleime_Chupong Campaign"
Ia Drang Valley Battle? Which One? LTC Hal Moore Summoned to a Woodshed Session? "No Time for Reflection at Ia Drang" ? Pleime Campaign or Pleime-Ia Drang Campaign? Crushing the American Troops in Western Highlands or in Danang? * Pleiku, the Dawn of Helicopter Warfare in Vietnam, J.D. Coleman, St. Martin's Press, New York, 1988. * We Were Soldiers Once… and Young, General Harold G. Moore and Joseph L. Galloway, Random House, New York, 1992. * "First Strike at River Drang", Military History, Oct 1984, pp 44-52, Per. Interview with H.W.O Kinnard, 1st Cavalry Division Commanding General, Cochran, Alexander S.
* The Siege of Pleime, Project CHECO Report, 24 February 1966, HQ PACAF, Tactical Evaluation Center. * Silver Bayonet, Project CHECO Report, 26 February 1966, HQ PACAF, Tactical Evaluation Center.